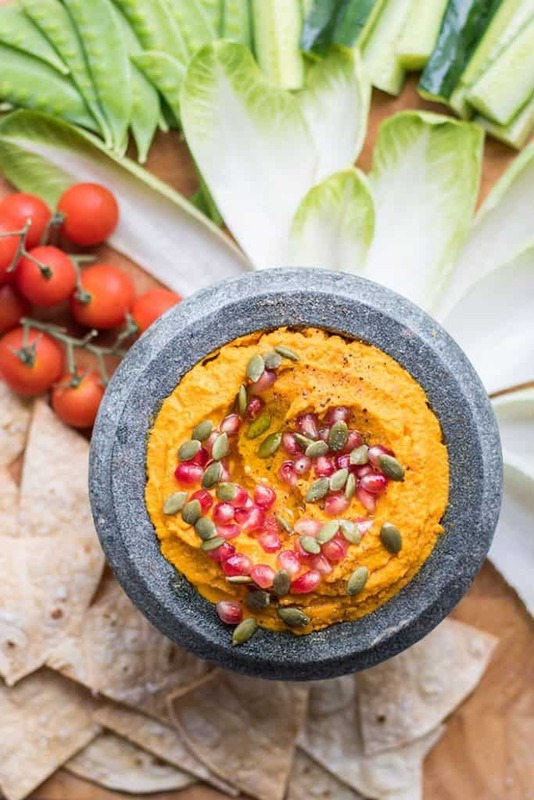 This Roasted Carrot Hummus is creamy and super sweet — and is made entirely from carrots, no beans in this dip! We were blown away by the intense flavor! Keep it Paleo/Whole30 by serving with veggies to dip. 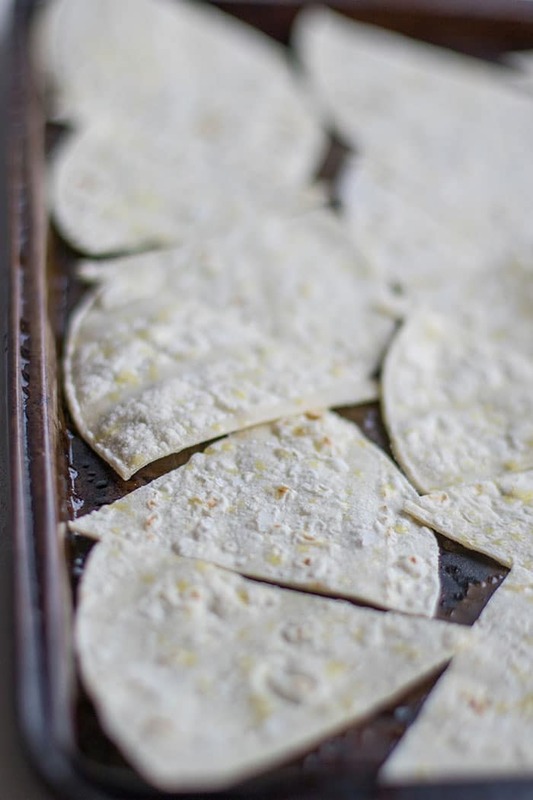 Serve it with toasted corn tortillas like I did, or add toasted whole grain pita bread. Last summer while in Oregon, we visited Drake, a somewhat new restaurant downtown. Everything we ordered was great, but I haven’t stopped thinking about the carrot hummus we ordered as an appetizer! Don’t you just love when something is so good you can’t wait to recreate it? It took a few months, but here it is! The hummus at Drake was so smooth and creamy, with a great cinnamon infused flavor. While the other typical hummus flavors were also present, it was the cinnamon that really made it stand out. We love carrots and go through so many in our house -shredded on sandwiches, on salads, and they are always included in our pans of roasted veggies. They are such a great snack — even my toddler always steals a carrot when I pull them out to cook. We’ve been using this hummus for so many different meals the past few weeks. As a sandwich spread, a salad topper, a dip, and I’ve even been mixing it into spaghetti sauce to add a little sweetness (and healthy fats) to Xander’s meals. He’s such a sugar monster. This would be the perfect appetizer for Thanksgiving, or addition to a holiday party spread. Unique, and a real crowd pleaser. Plus, there are always people at gatherings who are trying to maintain a healthy diet (me! ), or someone on a specific eating plan (gluten free, vegan, Whole30, etc.). Make it Gluten Free: All of my recipes are gluten free, and I try to also offer gluten free serving suggestions. Rather than serving this dip with pita bread, I have been toasting corn tortillas. I cut them in wedges, brush with olive oil, and sprinkle with sea salt, then toast in the oven at 375 degrees F for about 12-15 minutes, until lightly golden brown. 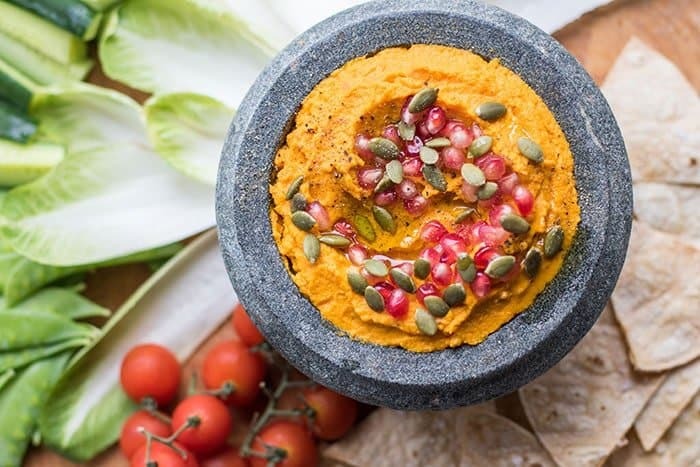 Make it Paleo/Whole30: This dip is a great Paleo or Whole30 option – just serve with extra veggies for dipping! 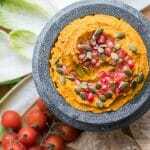 This creamy and sweet hummus is made from roasted carrots - not a bean in site! It's perfect served with raw veggies, endive, or toasted corn tortillas. It would also be great served with wedges of whole grain pita bread. 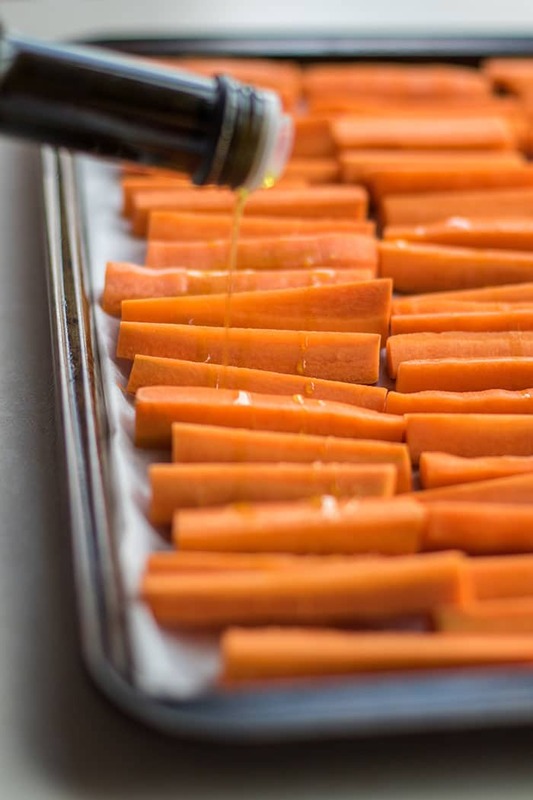 Add carrots to a cookie sheet, and drizzle with olive oil. Bake for 30-35 minutes until well roasted and slightly browned on the bottoms. Add carrots, tahini, lemon juice, olive oil and sea salt to a food processor or high speed blender. Process until the mixture is very smooth, 3-5 minutes in a food processor or less time in a high speed blender. Taste, and adjust salt and lemon juice to taste. Add freshly ground black pepper to taste, and freshly grated garlic, if desired. I usually leave the garlic out of this hummus. Add the hummus to a container, and place the 4 cinnamon sticks along the top to infuse the hummus with flavor. Completely chill in the refrigerator before serving. Remove the cinnamon sticks and stir well when ready to serve. Last summer, I purchased this oil sprayer from Amazon, and I love it so much I have ordered another so I have one for my olive oil, and one for coconut oil. It’s perfect for lightly misting veggies for roasted, or even for controlling the amount of oil you add to your salad. It doesn’t leak, and doesn’t need to be pumped like most oil sprayers (which never work well, in my opinion!). I had never had it until this summer, and I am hooked :) I love it on top of salads or just with cucumbers. That's part of the fun of dining out -- going home and trying to recreate dishes that you love! This dip looks so creamy and luxurious and I just want to dive into it with some of those chips! Thanks Marcie! Yes, it is creamy. Tahini makes everything wonderful. This looks wonderful! In terms of cups or tabelspoons, how big is the calorie related serving ? It's so delicious. It's about a 1/4 cup serving, a little more. I hope you enjoy!